There are so many benefits to gardening with kids. 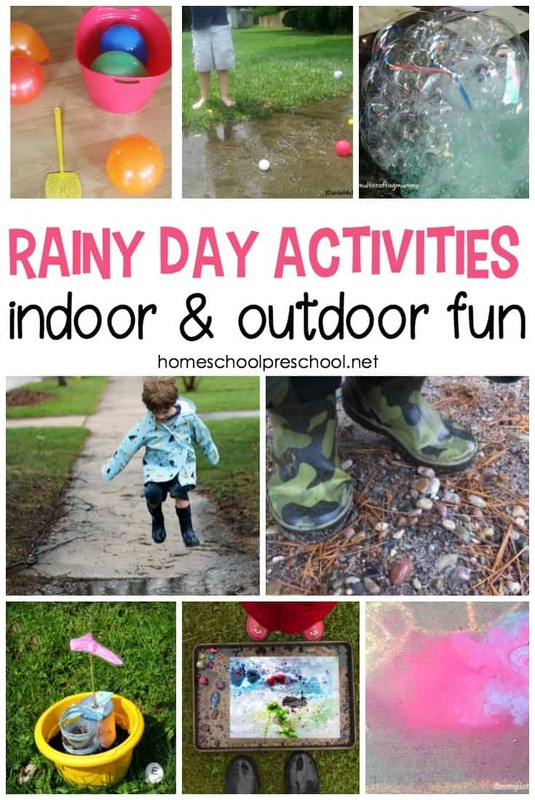 With this amazing collection of ideas and activities, your kids can learn about plants, try new foods, and tend their own garden spots. Spring and summer are ripe with learning opportunities. One such opportunity comes from gardening. I miss having raised beds in my backyard. The kids miss digging in the dirt, planting the seeds, and then anxiously awaiting the green sprouts that would begin to pop up through the dirt within a few short days. This year, we’ll be container gardening as we will have a very small backyard in our new home, but we still want to grow a small variety of our favorite herbs and vegetables. 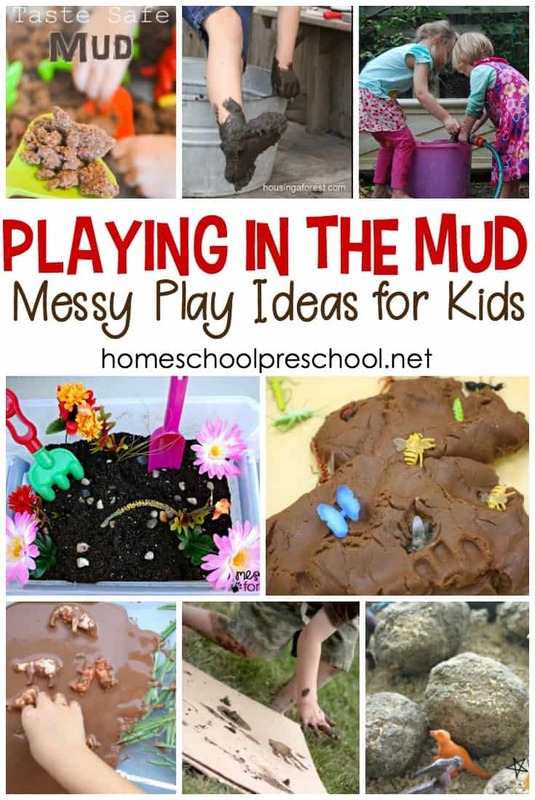 If you’re excited to be gardening with kids this spring and summer, I know you’ll love the ideas and activities I’ve collected for you! 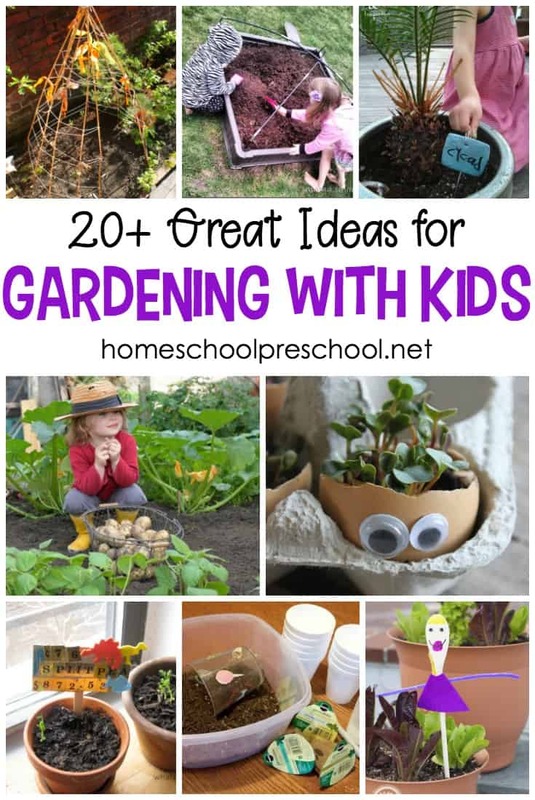 Gardening with Kids: Easy 3-Step Indoor Herb Garden – With Gro-ables seed pods, you and your preschoolers can start an indoor herb garden in just three easy steps! A Beginners Guide to Gardening with Kids – This guide shares tips for when to plant, what to plant, fruits and veggies to grow with kids, and more! Kid Made Garden Signs – These salt dough garden signs encourage writing practice in a fun and creative way. Kids will be excited to put these signs in their garden. Free Book about Gardening for Kids – This nonfiction early reader is a great way to show kids what they can do in the garden. Radish Top Egg Heads – Always a hit with kids, these egg heads are super easy to make and can be planted in the garden once they’re sprouted. Easy Kids Fort for the Backyard – I’ve never met a kid who could resist building a good fort! Summertime is prime time to build a teepee fort in your garden. When you plant peas and beans around the perimeter of the teepee, they’ll create a natural covering for the fort as they grow! 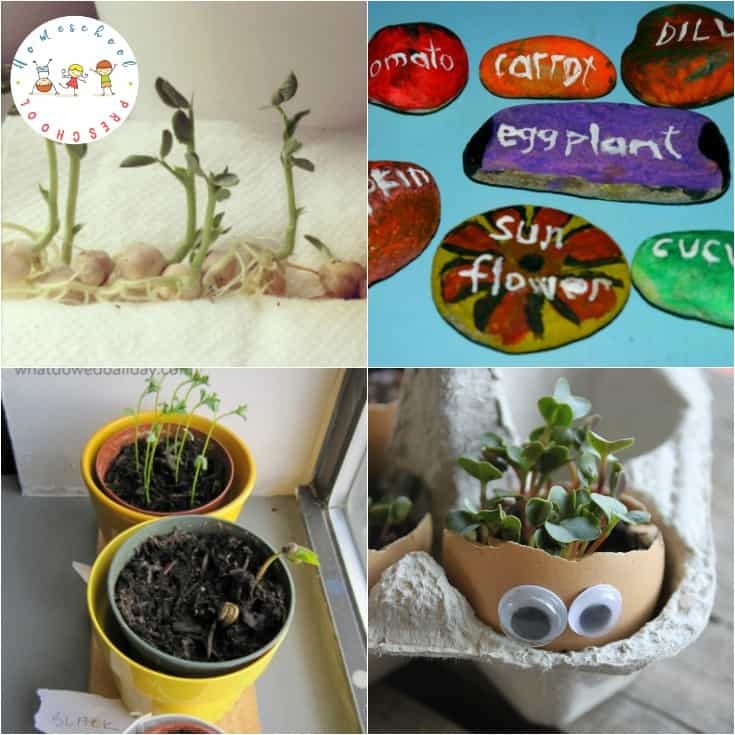 Clay Pot Resist Art Garden Sculpture – This beautiful, kid-made sculpture will liven up your entire garden! Building a Compost Bin with Toddlers – My daughter has been asking to make a compost bin for ages, and I’ve put it off. I find the idea daunting. However, this compost bin is looks very doable, and I can’t wait to show it to her. Kids Crafts Grass Heads – This is another springtime favorite for kids. Planting seeds and watching them grow is always fascinating. But, when you plant fast-growing grass seeds in a pot and make a face on it, the grass becomes hair as it grows. Kids will love giving their grass heads haircuts! Begin Gardening With Kids – Not only can you learn how to start a kid-friendly garden in three easy steps, but you can see how to make some really cute rock garden markers. Making a Garden Journal – Once you’ve got your garden started, make a garden journal with your kids. In it, they can make predictions, record data, and draw pictures of the plants they’re growing. DIY Garden Markers – Garden markers don’t get any easier than these markers made from colorful beads and floral stem wire. Even your youngest gardener can help make these markers (and work on fine motor skills at the same time). Wooden Spoon Garden Craft – These wooden spoon garden markers are super easy to make, and they’ll look great mixed in with your growing flowers and vegetables. Beaded Garden Ornaments – These beaded ornaments are the perfect decorations for your plants – indoor and out! How to Create a Worm Farm with Kids – My boys loved digging up wriggly, writhing earthworms when they were preschoolers. They would have loved building a worm farm in our garden, and our garden would have loved the nutrients worms add to the soil. Growing Seeds in a Plastic Bag – I’ve only ever sprouted dried beans in plastic bags. They’re great for showing kids the parts of a seed. I love the idea of sprouting a variety of seeds in bags, hanging them in the window, and tracking their progress in a nature journal. How to Build a Sunflower House – I have always wanted to build a sunflower house with my kids. I’m going to have to reserve a space in my new yard to make one with my grandson next spring. Where would you put one? Introducing Little Ones to Gardening – If you’re just introducing your little ones to gardening, these are great tips for getting started. How to Make a Seed Bomb – These seed bombs would be so fun to make with your preschoolers. They’ll have a great time tossing them in the garden and seeing what sprouts. Grow a Taco or Pizza Garden with Kids – We planted a taco garden a few years ago. We had tomatoes, peppers, cilantro (for salsa), and lettuce. A pizza garden would be fun, too. Check out how to do both. 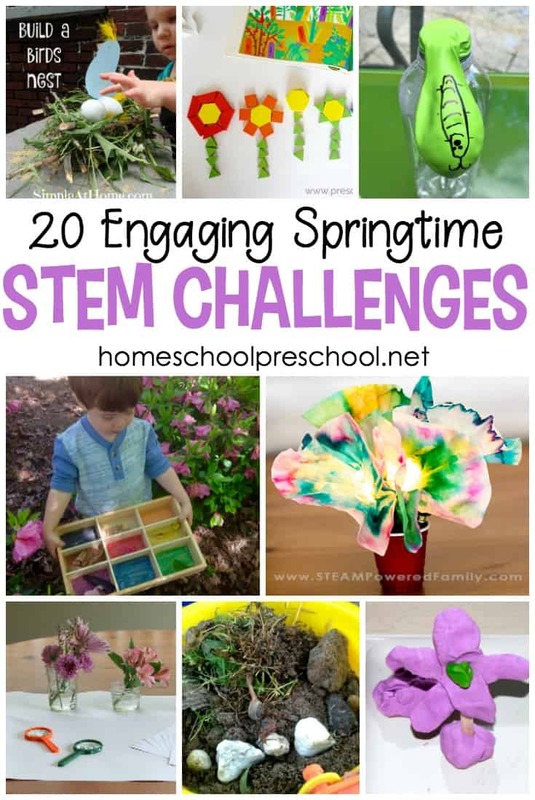 Plant Science Activity with Kids – If you don’t have garden space outdoors, you can definitely plant veggies and herbs indoors. It’s a great way for kids to get up close and personal with plant science. Egg Carton Greenhouses – If you’ve still got snow on the ground in April like we do here, you could turn an egg carton into a greenhouse to start some seeds indoors. 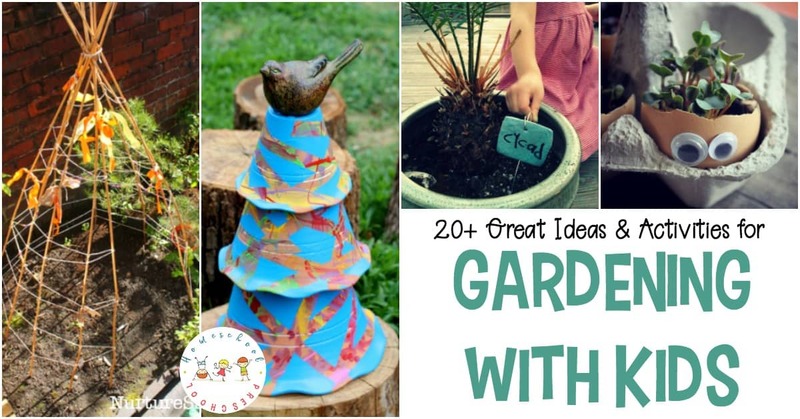 Which of these ideas will you try as you start gardening with kids this spring? What a fantastic resource!! Thank you so much for including our Grass Heads! Off to schedule to Pinterest!